BORN INNOCENT: The Blunt Force Effectiveness Of The ’70s T.V. Movie – Schlockmania! Believe it or not, there was a time when t.v. movies were cool and even a little dangerous. In the 1970’s, they had to compete with the artistic freedom of R-rated pictures without being able to have the explicit content so the clever filmmakers began gently pushing the envelope in every way during this time. The best films rose to the challenge with tough subject matter, compelling scripts and great acting that could convey intensity without getting explicit. One of the best in that select category is Born Innocent. This gritty tale focuses on Christine Parker (Linda Blair). The viewer is immediately put into her shoes in frame one as she processed through the jail system and placed in a state girls’ home. It is soon revealed that she is not a bad kid: Chris is merely a runaway trying to escape a bad home life. Although it’s su pposed to be a halfway house for juvenile delinquents, this ‘home’ is more like a training center for future prison inmates and Chris finds herself victimized by the more brutal residents – the worst is a scene where the resident group of toughs rapes her with a broomstick, a scene that remains brutal by modern TV standards. This is the k ind of premise that could have lapsed in exploitation or senseless moralizing but Born Innocent thankfully does neither. Instead, it presents its story in a non-affected style and leaves the viewer to their own conclusions. Gerald DiPego’s script never flinches from the brutal aspects of the storyline but it also refreshingly portrays everyone in a dimensional fashion – no one is evil in this story, just flawed and misguided. Donald Wrye’s nicely understated direction bypasses overt stylization, utilizing a straightforward visual style and a carefully modulated pace that slowly builds in intensity as bad circumstances and the failings of others back Chris into a corner. Born Innocent also boasts strong performances: like the film’s style, they are naturalistic in style and all the more effective as a result. All the girls look and act in a believable teenage style, with soon-to-be exploitation star Janit Baldwin doing some memorably fiery work as one of the most feisty girls. In the area of adults, Joanna Miles makes a strong impression, veering between frustration and impassioned idealism as the one truly dedicated teacher at the school. Reliable character thesps Richard Jaeckel and Kim Hunter also notch up a few memorable scenes as Chris’s dysfunctional parents. Both do an admirable job of making the parents into characters who sincerely mean well but are too irrespon sible to be good role models (Jaeckel’s abrupt mood swings are both terrifying and all-too-believable). 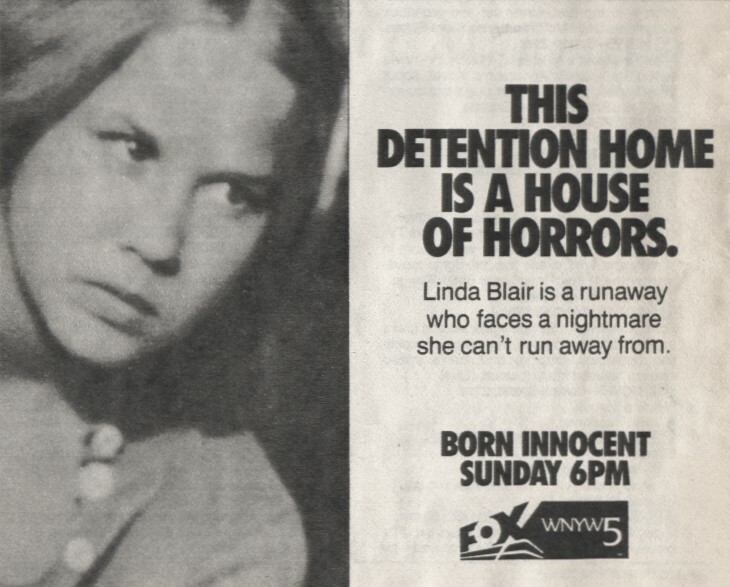 However, Born Innocent truly belongs to Linda Blair. She gives a performance of impressive depth and control here, making the transition from meek, introverted innocent to jaded, embittered delinquent as believable as it is heartbreaking. It’s a shame she rarely got a chance to play similarly strong material elsewhere in her career because her work here shows she had the talent to take a Jodie Foster-styled path to adult respectability. Simply put, Born Innocent is a strong t.v. movie that retains its power decades after the fact. Just because something was made for television doesn’t mean it can’t pack a punch – and this film might leave a mark or two on you.